As seen in the video below, Telemundo reporter Harry Ruiz recently interviewed Rey Mysterio and asked him about some of WWE's Latino Superstars, including Kalisto, Lince Dorado and Andrade "Cien" Almas. Mysterio said the state of Latin talents in WWE is "incredible" and that the only thing they need now is for someone like him to "link" them all together in a stable to help push them. The reporter asked if Rey could see a revival of The Latino World Order and Rey asked, "Why not?" Rey then gave a lWo shout-out and the reporter asked if Vince McMahon was listening. The lWo was a WCW stable that was around in 1998 and 1999. Members included Rey, WWE Hall of Famer Eddie Guerrero as the leader, La Parka, Psychosis, Juventud Guerrera, Silver King, El Dandy, Hector Garza, Villano V, Damian and Ciclope. 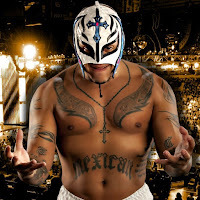 Rey has been rumored to be in contract negotiations with WWE for some time now and there is still a chance that we see him return to action this year. Rey returned to WWE for the 2018 Royal Rumble match and later worked the Greatest Royal Rumble match from Saudi Arabia in April. You can watch a clip from the interview below. Thanks to @NaNo__11, @mizfits1, @GioSarmiento, @ivanbeas4 and @mykeabraham for translating the clip.